If you have several missing or failing teeth, dental implants offer the best and most natural tooth replacement solution. Each tooth can be replaced with one dental implant and a porcelain tooth (crown). It is also possible to use dental implants to support a porcelain bridge. For example 2 implants may hold a 3 tooth bridge, or 3 implants may hold a 5 tooth bridge. 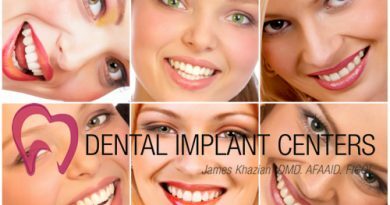 Your specific condition should be evaluated by an experienced dental implant expert for the number of implants required to replace your missing or failing teeth. Several factors are considered for this determination, including, but not limited to: volume and density of bone, gum condition, load factors, esthetics, number of missing teeth, number and condition of remaining teeth, jaw joints (TMJ). Traditionally missing teeth were replaced with either dentures or bridges. In todayâ€™s modern dentistry, replacing teeth with dentures or bridges is no longer the best option or even an acceptable one. Dental problems associated with these restorations are complex and varied. Bridges are anchored to adjacent natural teeth (abutment teeth). This requires drilling down those teeth to almost half the size. Drilled teeth become weak and sensitive and more prone to decay. Quite often those sensitive teeth require root canal treatment. Bridges usually fail due to decay and fracture of root canal teeth, and this results in more tooth loss. Dentures are even worse. These removable restorations are bulky, uncomfortable, catch food particles, interfere with speech, are often painful, etc. Both dentures and bridges cause facial bone loss, which is the primary cause of facial collapse and premature aging. If you have failing teeth that should be removed, it is important to know that the best time to place dental implants may be at the time of tooth removal. Remember that the most critical consideration after losing a tooth is to maintain the integrity of jaw bone. This is possible only with dental implants. Like natural teeth, dental implants, which are anchored in the jaw bone, are able to transmit chewing forces to the surrounding bone and stimulate bone remodeling (a natural biological process which constantly destroys old bone cells and replaces them with new cells). This process continues all through life, as long as natural teeth are present, and is responsible for maintaining the volume and density of jaw bones. However, it slows down sharply after tooth loss, and results in jaw bone shrinkage and collapse of facial structure. To learn more about the consequences of bone loss, you may read Dr. Khazian’s article “FACIAL BONE LOSS AND PREMATURE AGING“.